Welcome to the Anglican Parish of Lower Hutt! We seek to love and share Christ with others in the heart of the Hutt, and in the Hutt’s western hills. We are a friendly and accepting community where people of many nationalities and styles of worship find a place. Our Parish consists of two churches; St James’ in central Lower Hutt and All Saints’ in Belmont Domain, Lower Hutt. Our church programmes are geared to all ages, from pre-school to the elderly, and we have a strong ministry to children, youth and families, including a chaplaincy service to Chilton St James School. Join our men’s, women’s or youth groups, our youth or adult music groups, or one of our home groups. We aim to grow in the love and service of God and of others, and believe that we do that best in community. 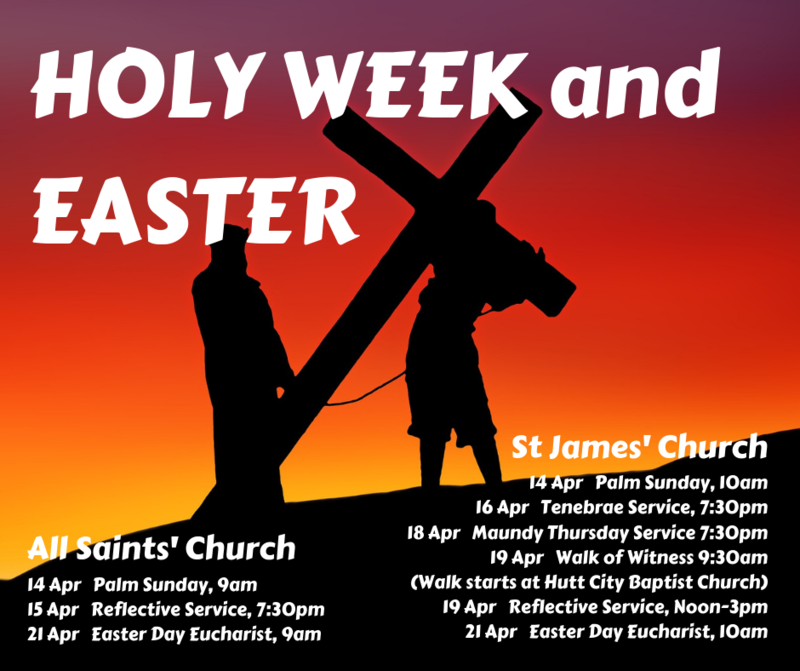 We would love you to join us during Holy Week and on Easter Day!